Sitting in Sava Lelcaj’s new market, babo, it’s not uncommon to see one of the chefs run from behind the food counter to grab an eggplant, a tomato or a fresh loaf of bread. As they prepare the daily two dozen salads and various sandwiches, they are sure to use products straight from the store. “The chefs come out here and pick their produce and their cheese and create whatever they need to create,” said Lelcaj, who opened babo: a market by sava on the first floor of Sterling 411 Lofts on East Washington Street last Wednesday. 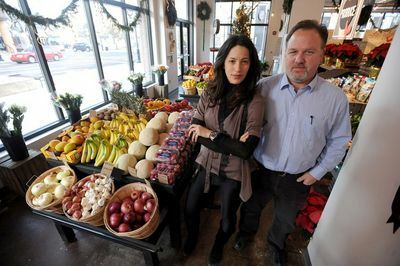 Lelcaj’s market is a combination of a specialty store, a carry-out restaurant, a coffee shop and a soon-to-be wine bar. There is free Wi-Fi and two seating counters. The store also boasts of various artistic elements, from chairs made out of salvaged wood from a collapsed barn in Chelsea to cast-iron pans used as the babo sign. The store’s visual director, Dave LeFave, has repurposed items to display food and decorate the market. Stoves, painted cardboard boxes, electrical wire spools and an old wardrobe from Detroit are used as displays. Platters from thrift stores and pages cut out from old books line the walls. Along babo’s shelves, there are prepared foods, frozen foods, produce, specialty cheeses, olives, spices, fresh bread, bagels, milk, eggs, yogurt, soda, pastas and sauces, honey, jam, cereal, and sweets. The store has also partnered with local stores to offer products like coffee from Zingerman’s and hummus from Jerusalem Garden. But don’t expect to find more mainstream products like a Coca-Cola or Oreos. They also wanted to be health conscious, she added. Some of the items in the store are on the expensive side, such as the specialty cheeses, but general manager Paul Hannah said babo was really designed to be affordable. A prepared sandwich runs between $6-9. A small, pour-over coffee is $2. A box of Puffins cereal is $6. Sava Lelcaj and babo general manager Paul Hannah opened the downtown market last week on East Washington Street. Since opening last week, Hannah said business at the store has “far exceeded” expectations. From 411 residents to “townies” and business people, the store has been bustling with customers. But a sign at the front of the market warns people: Babo is still evolving and will change in the coming months. By spring, Hannah said he hopes to have the license to sell beer and wine. Babo could also become a late-night pizza stop down the road. And when the weather gets warmer, look for outdoor seating and music playing. The store is also bringing in a large chalkboard for people to write suggestions — and the store will be altered based on customer feedback. Wed, Dec 14, 2011 : 12:47 p.m.
Congrats to Sava and her team! Wed, Dec 14, 2011 : 1:59 a.m.
Had the tilapia sandwich and mac-n-cheese for lunch this week - will definitely be back for more! The mac-n-cheese was really outstanding. Picked up some Marcona almonds on the way out. Great to have a place like this downtown. Anybody know if catering plans are in the works? Sava did a great job on the a2skatepark fundraising dinner (swordfish, duck, filet mignon, !!!) Congrats to Sava and her crew! I am blown away by the hateful comments I am reading. I have been to babo a few times now and what a joy it is to walk into such an estheticaly pleasing place of artistic style and beauty. Everything is so appealing to the eye and the music is so inviting. How could you not want to shop here! All the food is delicious, the smells embrace your senses and there is honestly something for absolutely everyone to purchase in a variety of price ranges. And the coffee????? WOW!!! Have a cappuccino, an expresso, a latte, a pour over or whatever you desire. The aroma is magnificent, the flavor on your palate is silky smooth, and the prices are just right! So if you are a &quot;foodielover&quot; you will have no problem finding delectable items for yourself, your family or for a special gift! Good luck babo...you are just what Ann Arbor needs and I for one am thrilled you are here!!! Thrive and prosper! You've got a friend and customer in me! And to whomever compared babo to Sparrows...I love Sparrows and I am glad they are here....but shame on you! Tue, Dec 13, 2011 : 9:45 p.m.
One of the essentials for having people live downtown is having a place to shop nearby for fruit, bread, milk, etc. I know there are a lot of Michiganders that think one should just hop in the car and drive to Meijer or Kroger and fill the back of the van with $200 worth of groceries, etc. However, if you have ever spent time in a real urban area such as New York , Chicago or Toronto, you would see markets such as this one, the White Market, and other small shops. It's essential that if we really want to encourage higher density in the downtown and less sprawl, that these ventures succeed. As for other small shops that have closed on Liberty, etc., it IS more about unreasonable rents, absentee landlords, and less foot traffic with the closure of an major anchor store. Well said and Borders is and will be missed for years to come! If Babo succeeds more than a year, that's great. However, what downtown A2 needs to thrive in the long run is a much wider range of businesses and residents. Establishments that cater to the handful of wealthy downtown residents who live in lofts with rents at several thousand dollars a month are not going to create a long term downtown core. Nothing wrong with having a few elite around, but for a healthier and more stable downtown long term economy, downtown housing needs to be more reasonably priced, and there needs to be basic services available, such as a good, comprehensive grocery store with reasonably priced items. All the &quot;regular&quot; businesses have been pushed out (department stores, drug stores, etc) by the coffee shops, restaurant row, bars, boutiques and elite lofts. That is precisely why there is so much turnover in the businesses and why long term family businesses have been pushed out over the years. Downtown A2 is a bit like an upscale Disneyland, an artificial playground, with everyone looking to &quot;cash in&quot; on the elite residents and rich students. Good luck to Babo! Tue, Dec 13, 2011 : 10:05 p.m.
Feel free to open whatever you like. Tue, Dec 13, 2011 : 9:33 p.m.
People who complain about prices and compare this space to a larger stores scattered around the beltway of Ann Arbor are obviously not considering the time and money it takes to have a car or some other transportation to have access to larger stores. Driving to a grocery store and buying a week's worth of goods is penny wise but pound foolish. Close and walkable places such as this one allow people to buy what they need, when they need it. I hope this place does well...downtown needs more independent and locally owned alternatives. Tue, Dec 13, 2011 : 9:18 p.m. I work just a couple of doors down from babo and I am SO excited that they are in the neighborhood. I've been eagerly anticipating their opening ever since it was announced. I went on opening day and was back again the next day for more. Sure, the prices on some of their produce and other grocery products are on the high side, but their deli prices can't be beat. I don't know of any other place, with the exception of my own kitchen, where I can get a cup of seriously good soup for $2.50. Toss in a loaf of crusty bread and a drink, and I still paid well under what I often pay for lunch downtown, whether in a chain or in a locally-owned restaurant. The sandwiches were well-priced, too (most were around $7 and were huge). I am going to be a frequent customer. Tue, Dec 13, 2011 : 8:22 p.m. When I think local grocerys I think of Kerrytown. I shop at the Farmers Market once a week and I stop at Sparrow Market (in Kerrytown) at least twice a week. It's easy to pull into Community High to park on Saturday and when the FM isn't going on I can always find parking in that lot to run into Sparrows. They have both conventional and organic choices, a lot of local products and their market is overflowing with food, (reasonably priced too for &quot;downtown&quot;) I happen to always go there afterwork and park for free after six :) and they sell Zingermans Bread. Kerrytown/Farmers Market on Saturday is my family destination for stocking up on groceries for the week. Sparrows makes great sausages and his turkeys for Thanksgiving are always the best. It must be well liked as they are always busy there. I disagree sally, there are prices all you have to do is look above the produce to see a sign, I've had to ask exactly twice for a price, once because the sign had fallen down the other b/c the item had just come in and was just put out before they finished making the sign for it. Tue, Dec 13, 2011 : 9:24 p.m. The last time I was in Kerrytown looking at the food displays, nothing had a price on it. I had to ask the clerk for prices, which is not how I shop, at least. I guess if the produce doesn't have a price, and you have to ask, you are shopping in the wrong place. Kerrytown shopping is boutique shopping and the produce is overpriced, to say the least. Tue, Dec 13, 2011 : 6:48 p.m. I am tired of the elitist attitudes of Ann Arbor. Over priced items, &quot;staged&quot; displays and vying for the business of the rich and privledged? Yet stores are closing their doors in an alarming number. What seems to be forgotten is that the biggest population in the downtown area consists of STUDENTS. Yet there are no average priced stores for them to purchase fresh fruits and veggies. Not even a laundrymat within walking distance. The whole idea of overcharging to create an air of specialty is geared to those with overblown egos. $6 for a box of cereal? really? There is no difference between this store and the small grocery stores in Detroit that overcharge because they know the people living nearby have no way to get to other stores. I hope the folks in 411 enjoy being taken advantage of as they sip theire $2.00 coffee and pay double for their cereal and other items. I give it 15 months. Tue, Dec 13, 2011 : 8:52 p.m.
That store for the non-wealthy hordes of students exists--White Market on William. Unfortunately, it's not flashy and it's not new, so it will continue to e ignored. Tue, Dec 13, 2011 : 7:51 p.m. The rent on a one-bedroom unit at Sterling 411 is $1625. A student who can somehow afford that much in rent a month in rent probably doesn't care if his or her cereal or whatever costs more than at Kroger. Tue, Dec 13, 2011 : 7:17 p.m. Sounds like you're one of true same people that thought she wouldn't survive for less than a year in the larger restaurant space. A few other things... - whole foods sells cereal for $5 or more, it doesn't pay downtown AA rent and it is a large national business. They do well enough to support two locations that are about 5 miles apart. - $2 coffee for a pour over? Really? Zingermans charges $4 for 3/4 the size. Comet charges $3 or more. espresso royal, sweetwaters, Starbucks and all other local coffee houses charge $2 if not more for coffee sitting in plastic brewers. - if something costs 15-50 cents more it is definitely worth my money and time not to go to whole foods, Kroger, meijer, etc... Stores are closing doors at alarming numbers because brokers are killing lease rates not because store owners are choosing to over charge. What's the logIc. I'm 100% sure she'll still be in business 2 years from now while you're still upset about something. Here's a thought, why don't you open up your own business instead of complaining from your armchair. Just stopped in for the first time, and I was so pleased! Lots of friendly people, asking for feedback and passing bacon. The brands make me very happy -- natural and healthy and brands I trust. I was happy to see many Michigan-sourced items, and would encourage as much of this as possible. I wonder if some produce could be wholesaled from a local farmer? And in the deli, I tried the swiss chard salad and it was above expectations. Thank you, Sava, for taking this risk, and creating a delightful addition to downtown. Tue, Dec 13, 2011 : 4:53 p.m. The store looks beautiful, but this is what gets me (especially in light of the Applebees and Kroger comments): &gt;&gt;A box of Puffins cereal is $6.&lt;&lt; Why would anyone pay $6 for a box of Puffins when you could go to Arbor Farms (also a long standing and well-respected local business) and get it for less than half that price? I get that you pay for the convenience factor with a downtown market, and I can see why the folks in those lofts would love being able to grab some produce downstairs. But I could never justify paying that much for cereal (and many of the other products on the shelves at babo) when I could get it for half as much at another local business that I already love. No, not meijer, not Kroger, and certainly not Applebees. It might serve babo better to focus exclusively on made-in-MI products or something to really set themselves apart. but again, the store looks AWESOME and I look forward to trying some of the deli stuff. Tue, Dec 13, 2011 : 3:14 p.m.
Angela Cesere's photos of the market are beautiful. They capture of a glimpse for those who haven't made it in there yet. Tue, Dec 13, 2011 : 3:13 p.m. The market is amazing on so many levels. First a thanks to Sava for putting together such a wonderful place right in the middle of downtown. I support local and I appreciate someone like this taking a huge risk and creating jobs for our community. I've lived blocks away from this location for close to a decade now and I cannot tell you how nice it is to walk into a place, pick up some fresh produce and grab a good coffee. The place is a little sparse, but they've been open less than a week and I imagine that will change (big sign up front saying they're adding products daily). I can tell products have changed/ been added so when they say it is evolving it shows good business sense, find the right products and prices for your customers. And suggestion - I'd like to see a few main stream products, like gatorade or some sports drink and maybe a few cereal options. The prepared foods section is awesome and cheap, I've stopped by there every day to grab something for lunch or dinner. A pour over coffee costs $2 compared to elsewhere. The market is also very aesthetically pleasing, from the art and product placement/setup and wood chairs that look like they were made out of box crates, to the community table. The community table is probably one of the best features. Very european, with everyone sitting close and eating together. I've already had a couple great conversations with complete strangers already. Last, from what I can tell (based on the restaurant), Sava is very good operator, an extremely hard worker and someone that cares about her customers. The restaurant has been open for almost two years now and I've seen nothing but improvements there; I expect the market to be no different (although it has already surpassed my expectations). Tue, Dec 13, 2011 : 2:45 p.m.
Gosh, I'm not what sure other people are seeing when they step foot in Babo's, but it is a wonderful addition to the downtown. The store is new, beautiful, and, unlike the big box grocers that some are mentioning, has character that, say, Kroger and Meijer, lack. A couple hundred people live directly above the shop, in Sterling 411 Lofts, and enjoy the convenience. I have no doubt that they would rather get a late night pizza slice there than at the Hookah shop 20 minutes away. The small premium one may spend for the local fare is well worth it. Hannah and Sava have crafted, from scratch, a beautiful place for Arborites to mingle, shop, and enjoy a cup of specially-brewed coffee with a delicious prepared meal. People should definitely give this place a chance; I'm certain you won't be disappointed. Tue, Dec 13, 2011 : 2:32 p.m.
Tue, Dec 13, 2011 : 2:22 p.m. Question of honest curiosity here: what is the difference between babo and Sparrow Market? I mean, it seems to me that the general concept is the same (aside from the future goals to sell 'late-night pizza' at babo), not to mention they aren't significantly far away from each other. Personally, I think this market idea is wonderful, but it'd be great to hear customers/commenters say ,&quot;I can't wait to shop here every week&quot; instead of &quot;this store will be great for the small percentage of downtowners that can afford it.&quot; I understand that it's tough times and many small businesses are doing what they can to stay around, but with the increase in the price of downtown parking in addition to limiting the food options to high-end items at babo, how will this business establish a solid clientele base? There must be a way to incorporate more lower-priced and moderately-priced items while maintaining a similar atmosphere. (I don't necessarily trust the manager when he says there are many 'pocketbook-friendly' items.) Nonetheless, I hope babo can find a way to assimilate into the downtown area while offering something unique. Tue, Dec 13, 2011 : 2:12 p.m.
To all of you who routinely complain about high prices from any business profiled in AA.Com: Not all of us have Applebee's tastes. Not all of us believe everything of value should have a Walmart price tag. Not all of us believe an entrepeneur brave enough to open a store out of the ordinary should sink or swim on razor-thin margins. Not all of us believe a store's niche and value can be determined a week after it's opening. Not all of us believe any business that associates with Zingerman's or their products is for the lofty noveau-riche of the city. Not all of us believe your prophesies and proclamations determine winners and losers in the grand scheme. Sava deserves a fair shake from all of us. She's taken a big risk and made a bold attempt, and she's barely been open a week. Cut her some slack already. There is a lot of distance between Applebee's and Zingerman's. Zingy's charges NYC prices on bread, at $5-$7 a loaf for gourmet bread, and $20 sandwiches. Even food reviewers from other cities have remarked on the overly high prices at Zingy's. This is A2, not NYC or San Francisco. Applebee's is a mediocre chain at best. Not everyone in between thinks Walmart is the only place to shop. People want reasonable items at reasonable prices, not some over inflated downtown pricing scheme that caters to the wealthy who live in the overpriced lofts or the rich students. There is a middle ground but commercial interests are ignoring it in the name of high profits. Tue, Dec 13, 2011 : 3:15 p.m.
And I'm sure they'll catch the price differences and change them. Her restaurant serves food that costs about 20% less than every other comparable place in town. Point is, she's been open for less than a week, people should relax a minute. I'm not complaining about gourmet products being expensive. I'm complaining that they're selling Chiquitas for almost twice as much as the organic alternative at PFC, which is already more expensive than pretty much anywhere else in Washtenaw. Tue, Dec 13, 2011 : 2:03 p.m.
Sava doesn't look like a 1%er but if you own store in downtown Ann Arbor you have to be. Wed, Dec 14, 2011 : 7:14 p.m.
Not trying to be mean, but what exactly does a &quot;1 percenter&quot; look like (to you)? Do you picture guys dressed up like Mr. Peanut with top hats and monacles or something lol? Tue, Dec 13, 2011 : 7:58 p.m.
Tue, Dec 13, 2011 : 1:47 p.m.
seems like a high end store in the student district, not sure if that is filling a big whole in the market or if they just chose a bad location. A2comments is dead on, they have no plan just lots of 'we may do this'. This may work to allow them to evolve but they really don't seem to have their head on straight. They want to do pizza when there are at least two late night pizza places already on S.U. (on next to hooka bar and the backroom). Tue, Dec 13, 2011 : 1:37 p.m.
Look's like a nice place to visit. Best of luck. Tue, Dec 13, 2011 : 1:32 p.m. I visited the store over the weekend and agree with the comments that mentioned that their prices were too high. It's nice to see groceries available in the downtown area, but it's boutique shopping and boutique prices. But I guess the rich folks who live downtown can afford it. Good luck! Tue, Dec 13, 2011 : 1:26 p.m. It is always good to support local business, and while I personally find the approach of this one extremely pretentious, it is a beautifully designed space. However: we have the habit in Ann Arbor of opening new businesses that are repeats of those already existing offering a very similar service. I would point to other food markets within walking distance of downtown, some of which have been there for decades (the Co-op, Knights, etc.). While it is good and well to pat one another on the back and write glowing articles every time someone opens any new business, many of the old ones are faltering and faltering badly. Perhaps the Ann Arbor.com staff could be mindful of that and be more 'equal opportunity' in its coverage of local business. The vast majority of articles are about new business and those downtown. However as us &quot;townies&quot; know, Ann Arbor is far more than the few blocks on around Main/Liberty/State, it would be nice for other areas and older businesses to get equal coverage. Way too expensive and a lot of wasted space. They somehow manage to charge more for produce than PFC--only here it isn't organic. Tons of empty space and low light in this place make it feel cavernous--and that space could be filled with, you know, more food. I hope they do well, but they definitely do need to change some things. Tue, Dec 13, 2011 : 12:54 p.m. Very nice store. We visited over the weekend and the folks were very friendly and engaging. Prices may be higher than Kroger, but it's the convenience for downtown folks of having a store nearby, which is a time-saver. The tilapia sandwiches that were prepared looked huge, and seemed well worth the price of $8. Maybe the business plan is to develop based on customer needs- there's nothing wrong with this as long as the economic curve allows for a customer relationship to be built. That's why places like Downtown Home and Garden are such jewels. If the place were like a chain store I'm sure I'd never go there. Tue, Dec 13, 2011 : 12:23 p.m. Interesting concept and really only intended for the wealthy folks who live downtown, but it beats the heck out of a bland chain store or even worse, an empty storefront. Tue, Dec 13, 2011 : 12:09 p.m. I like this. The pictures show a very inviting place for people who live or work downtown to shop. The food looks good too. I wish them much success. Tue, Dec 13, 2011 : 11:30 a.m. Sounds like they are winging it vs having a business plan. Unfortunately, it's hard to be successful without a business plan that includes marketing.